Love and romance are ageless, and everyone deserves a chance to make a connection with a special someone. SeniorConnectionOnline.com invites singles over 40 to try their hand at finding love again on a site that has millions of active members and a large international dating pool, making it the perfect place for mature singles to explore the online dating world and make friends from around the globe. Senior Connection Online offers a range of interactive features to appeal to the bold and the timid. If you enjoy being the center of attention, take advantage of the VIP option to have pop-up prompts of your photo that encourage others to flirt with you or check out your profile. In a standard Gold account, you can send mail or introductory icebreakers to make those first steps toward a connection, or use the blocking feature to avoid unfriendly users you prefer not to encounter again. The Summary and Added Media tools make it easy to stay up to date on who you've been contacting and any changes they've made to their profiles. Only you can determine your comfort level, so explore the text, voice and video chat options as you become more familiar with individual members. The website also lets you see who is available now or provides suggestions based on your profile. Flirting and winking offer a quick method of bookmarking profiles you want to view again later or letting other singles know you're interested. The sign-up process only takes a few minutes and requires a quick email activation link. The company aims to restrict the community to members of at least age 40, which is reflected in the birthdate options when you start the process. 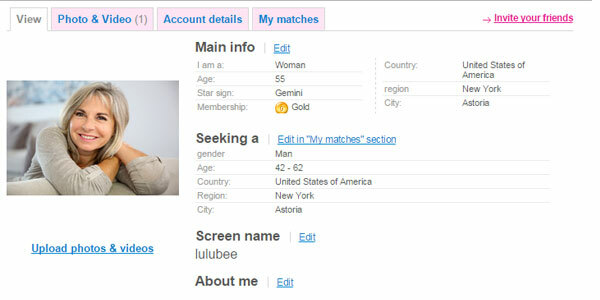 The profile page covers the basics of online dating, let you share details about your interests and specify what you are looking for in a potential match. With the free trial, you can complete your profile, add media and browse the profiles of other members. You can also perform basic interactions, including winking and receiving chat requests from VIP members. Senior Connection Online means business when it comes to the website's firm age policies. The staff reviews profiles within 2 to 24 hours, so moderators may reject fake photos or deactivate and ban accounts that appear to have false age information. The good news is that this strict approach approves the quality of the dating pool and makes you less likely to encounter singles who are outside your target age range. The website is subject to the Swiss Federal Act on Data Protection and regulated by the European Union, protecting your private information from being sold to third parties. Senior Connection Online uses a combination of voluntary reporting and manual and electronic verification to eliminate as many fake accounts as possible, and the website caters to its mature community by providing tips on online safety. 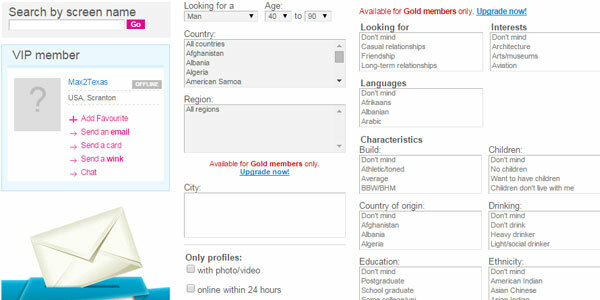 Signing up automatically grants you a free trial membership to explore the website before making a commitment, but the website often provides trial Gold memberships as well. The standard prices for a paid Gold membership are $39.99 for one month, $24.99 monthly for six months, $19.99a month for one year and just $14.90 for an optional VIP add-on. Purchasing a Gold membership is highly recommended if you enjoy the site, as it grants you unlimited messaging, text and Webcam chat, and the ability to view other members' media galleries. The VIP option lets you connect with every type of member and gain visibility through priority listing. The setup of Senior Connection Online is optimized for a mature audience, providing pop-up instructions and tutorials to help you fill out your profile and upload photos and videos. The convenient chat demo walks you through the entire chat messaging process, so you can focus on feeling confident when interacting with your matches in real time. The website displays few ads, and a continuous cycle of potential matches populates the left side of the screen, making it easy to start flirting while you learn the interface. The complexity of the search depends on how specific you want to be or rely on basic terms and an open mind. The quick search toolbar lets you browse for matches based on age, location, last login and profiles with media, which is more than suitable when you just want to explore your prospects. True to its name, the advanced search offers more in-depth options if you're particular about character, physical traits or interests, such as smoking and drinking habits, religion or hair length. Senior Connection Online is ever mindful of the lifestyle concerns of mature daters, so don't be surprised to see specialty search terms, such as health condition or whether you have adult children. Dating online is a process, not a science, and you set the tone for a great experience by finding the right website to suit your personality. Hopefully, this Senior Connection Online review will help you dive in with confidence as this is a great dating site for mature over 40 singles. If you feel that this dating site doesn’t meet your needs, check out our review of eHarmony.com for tailored matchmaker experience to find your perfect date.